CHINA: Chinese wind manufacturer XEMC has unveiled the country's first direct-drive 5MW offshore-specific turbine. XEMC board director Zhou Jianxiong said the company plans to install two 5MW permanent magnetic direct-drive offshore wind turbines by the end of the year. One will be in China and the other in Europe. The company plans to supply the turbine to domestic and world markets next year. The 5MW product is so far the largest offshore-specific wind turbine in the country and has been hailed as a milestone by Chinese industry officials. 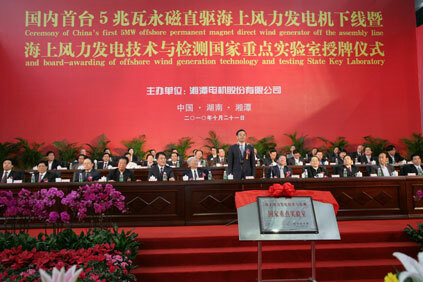 Zhou said the 5MW wind turbine involves 13 new patents. XEMC is the 11th largest wind manufacturer in China. In 2009, it spent €10 million in the acquisition of Dutch wind manufacturer and direct-drive specialist Darwind. The launch of the 5MW turbine follows a similar move by Sinovel last week when it unveiled its own 5MW onshore/ offshore product. In recent months, Chinese industry officials have pushed the country's wind sector to develop and use large-capacity wind turbines. Currently, the 3MW Goldwind wind turbine is the largest on the Chinese mainland. In June Shi Lishan, deputy director of the New Energy and Renewable Energy Department of National Energy Bureau said the main models of turbines for land-based wind farms should be 3MW and offshore wind farms 5MW or above. Additionally, he said Chinese manufacturers need to begin developing 10MW capacity turbine technologies.